To evaluate the long-term refractive and visual stability and the risks related to the implantation of Implantable Collamer Lens (ICL; STAAR Surgical, Monrovia, CA) phakic intraocular lens (PIOL) for myopia. This retrospective, consecutive, cumulative clinical study was performed in a group of 144 eyes implanted with ICL PIOL for myopia. Only the cases with clinical data available 12 years after the implantation were included in the series. Corrected distance visual acuity (CDVA), uncorrected distance visual acuity, spherical equivalent, refractive astigmatism, endothelial cell density, ICL vaulting, and postoperative complications were analyzed. Mean spherical equivalent refraction was −16.90 ± 4.26 diopters (D) preoperatively and −1.77 ± 1.93 D 12 years postoperatively. Mean CDVA at the first and last visit were 0.31 ± 0.19 logMAR and 0.22 ± 0.22 logMAR, respectively (Mann–Whitney U test, P < .001). Twelve years postoperatively, 8.9% of eyes had lost more than two lines of CDVA. The incidence of clinically relevant cataracts (13.88%) was significantly linked to the use of the V3 model ICL (chi-square test, P = .007). During the follow-up period, a significant reduction in PIOL vaulting was observed (Kruskal–Wallis test, P < .05), and the mean endothelial cell density decreased by 19.75%. The ICL PIOL provided good refractive outcomes and stability in the long term. The incidence of cataracts is low when the latest models of this PIOL are used. From the Department of Refractive Surgery, Clínica Baviera, Valencia, Spain (TM, JB); the Department of Refractive Surgery, Instituto Oftalmológico de Alicante, Vissum, and Division of Ophthalmology, Miguel Hernández University, Medical School, Alicante, Spain (JJ, GM, RM); the Department of Optometry, Universidad de Valencia, Spain (RM-M); and Clínica Baviera, Castellón, Spain (GM). To fill in this gap, we report the results of a large, retrospective, non-randomized, cumulative clinical study on refractive status and ocular safety performed in a consecutive group of patients with ICL PC-PIOLs throughout a 12-year follow-up period following implantation. This cumulative retrospective study included 144 eyes implanted with ICL PC-PIOLs between 1998 and 2001 for high myopia correction. All procedures were performed in four private hospitals belonging to Clínica Baviera (Valencia, Madrid, Barcelona, and Sevilla) by three surgeons (JB, TM, and FG) who followed the same criteria and protocol for indicating and implanting the analyzed PIOLs. Inclusion criteria for implantation were: spherical equivalent exceeding −10.00 D of myopia or contraindications for excimer laser surgery, anterior chamber depth (corneal endothelium to anterior lens capsule distance) greater than 2.85 mm, and endothelial cell density (ECD) greater than 2,000 cells/mm2 for patients older than 25 years and 2,500 cells/mm2 for younger ones. Patients younger than 20 years, cases with unstable refraction, eyes with any untreated posterior segment pathology, patients with previous history of uveitis, cataract, glaucoma, or anterior segment or angle-related anatomical alterations were excluded. Retinal lesions predispose the patient to retinal detachment or asymptomatic retinal breaks treated with argon laser before PC-PIOL implantation. In some cases, the eye’s preoperative refractive error exceeded the maximum dioptrical power of the PC-IOLs available on the market, which was 18.00 D at that time. Refractive excimer laser treatments after implantation were performed when necessary 3 months after the first surgeries and were not considered as a cause of exclusion, because in many cases the eye’s preoperative refractive error exceeded the dioptrical power of the ICL PC-IOLs available on the market. The software provided by STAAR Surgical was used to estimate both the dioptric power and size of the PC-PIOL, based on the central keratometric values, anterior chamber depth, subjective refraction, and white-to-white distance. Given that at the beginning of the study toric PC-PIOLs were not available, only V3 and V4 ICL lenses correcting myopia were included in the series. The main difference between V3 and V4 models is a change in the design that allows an additional vault height of ICL V4 regarding the previous model. The optic zone myopic zone of V4 ICLs was provided with an additional vaulting ranging between 50 and 150 microns with respect to V3 model because of the plane-concave profile (plane = the anterior surface, concave = the posterior surface). This study included all eyes that were implanted with this type of PC-PIOL between 1998 and 2001 in our clinics. The causes for data loss were: patients not attending the examinations and the need to explant the PC-PIOL for cataract removal. We considered a cataract to be clinically relevant when there was both a specific record in the notes of the patient and the loss of two or more lines in a corrected visual acuity test. Refractive predictability 1 month after implantation was considered for refractions less than −17.00 D, which was the maximum spherical equivalent that the ICL PC-PIOL was able to correct at the spectacle plane. This retrospective study followed the tenets of the Declaration of Helsinki and was approved by the corresponding Institutional Review Board. The methodology followed for PC-PIOL implantation was the same for all cases. The first procedures were performed under peribulbar or retrobulbar anesthesia, consisting of the injection of 4 to 8 cc of a combination of 0.5% mepivacaine and 0.5% bupivacaine. The surgeons then performed the implantation following the standard procedure under topical and intra-cameral anesthesia (two drops of Colircusí Anestésico Doble [Alcon-Cusí, El Masnou, Barcelona] 10 and 5 minutes before surgery and 0.1 mL of 2% lidocaine injected inside the anterior chamber as the first step of the surgery). The pupil of all eyes was dilated by instilling a single drop of phenylephrine 10% at 10 minutes before the beginning of the surgical procedure. A 2.75-mm superior limbal preincision and a paracentesis were performed using a 15 stainless steel Super-Blade (Alcon Laboratories, Inc., Fort Worth, TX). Once the intracameral anesthesia was injected, the anterior chamber was filled with a cohesive ocular viscoelastic device Healon (Pfizer, Inc., New York, NY). Using a 2.75-mm knife (Alcon Laboratories, Inc.), an incision was performed at the preincision site and matching the steepest axis of the refractive astigmatism. The PC-PIOL was then loaded into a cartridge that had been previously filled with ocular viscoelastic device and subsequently injected into the anterior chamber. A spatula (Katena, Denville, NJ) was used to rotate the lens, placing it with the haptics in the horizontal direction. Finally, after injecting a 1:100 acetylcholine chloride intraocular solution (Miochol-E; Novartis Pharmaceuticals Corporation, Basel, Switzerland) a superior iridotomy was performed through the main superior incision using a vitrectomy probe (Geuder, Heidelberg, Germany) in single-cut mode with irrigation at 100 cm water and aspiration at 300 mm Hg. An irrigation-aspiration Simcoe cannula was used to remove the ocular viscoelastic device, and the main incision was hydrated. No sutures were needed in any case. A combination of topical antibiotics and corticosteroids (Colircusí Tobradex; Alcon El Masnou) was applied postoperatively three times a day for a period of 3 weeks. All patients underwent eye examination at the clinic preoperatively and 1, 4, and 12 weeks postoperatively. After that, the patients came to the clinic on a yearly basis for a clinical control visit. At each visit, uncorrected and corrected distance visual acuities (UDVA, CDVA), subjective refraction, and intraocular pressure (IOP) were measured, and biomicroscopy and fundus examinations were done. The preoperative visit also included white-to-white distance measurement using a surgical caliper under biomicroscopical examination and ultrasound A-scans (OCUSCAN; Alcon Laboratories, Inc.) to determine anterior chamber depth and the eye’s axial length. Vaulting (distance from anterior crystalline to back central surface of the PC-PIOL) was estimated by comparing the corneal thickness and such distance following the methodology recommended in previous publications.17 A subjective vault classified in five levels was effected by comparing the separation between the lens and the posterior surface of the ICL to the corneal thickness using an optical section during routine slit-lamp examination. Following this scoring, a translation into microns distance was performed. Table 1 shows the vaulting scoring process. Specular microscopy using a non-contact TOPCON 2200 SP (TOPCON Corporation, Tokyo, Japan) analyzer was used to compute the corneal endothelial cell population before surgery. To be able to determine cellular density (number of cells/mm2: ECD), the cell count at the central corneal endothelium had to exceed 50 cells. The coefficient of variation (CV) was also computed both before implantation and 3, 6, and 12 months postoperatively. A significant number of patients missed one or more postoperative visits. Thus, to avoid the bias effect due to the variability of the population attending a particular follow-up visit, it was not the mean ECD at each visit that was considered but rather the mean of the intra-subject variation of ECD considering each period of study. The main outcome measures considered for the study were: UDVA and CDVA for visual outcomes, sphere, amount of cylinder and spherical equivalent for refractive data, ECD, vaulting (ie, distance between PC-PIOL optical zone’s central part and the anterior capsule of the crystalline lens), IOP, and the rate of intraoperative or postoperative complications. Statistical analysis to estimate the impact of eight variables—some of them previously related with cataract formation after ICL implantation—was computed using bivariant analysis: patient age at the time of the implantation, anterior chamber depth before PC-PIOL insertion, preoperative spherical equivalent, 1-day vaulting, 8-year vaulting, gender, type of iridotomy, or PC-PIOL model. The data were tabulated and analyzed using the statistical package Sigmaplot 12.0 for Windows (SYSTAT Software, Inc., San Jose, CA). In those cases where the quantitative data were normally distributed, the arithmetic means for each group were compared using the t test or analysis of variance. When the data did not follow a normal distribution, non-parametric tests were used (Mann–Whitney U or Kruskal–Wallis) to compare medians. For the statistical comparison of qualitative parameters, frequencies of different categories were used to create a contingency table and a chi-square test was performed. A P value of less than .05 was considered significant. This study included 144 eyes of 86 patients implanted with ICL V3 (15 eyes, 11.45%) and ICL V4 (129 eyes, 88.55%) PC-PIOLs during the period from 1998 to 2001 to correct high myopia. The mean age of the patients was 30.69 ± 5.57 years (range: 21 to 45 years), and 103 patients (71.52%) were female and 41 patients (28.48%) were male. Surgery was performed on 75 (52.08%) right eyes and 69 (47.92%) left eyes. Table 2 shows axial length, anterior chamber depth, mean keratometry, and IOP. Only 112 remained the study 12 years after the implantation. The remaining 32 eyes were excluded from the last refractive analysis because either the patient underwent bilensectomy surgery (ie, PC-PIOL explantation followed by phaco-emulsification and PC-IOL implantation in the same surgical procedure [11 eyes; 7.63%]) or the patient missed the last control visit (21 eyes). Visual acuity and refractive outcomes are shown in Table 3 and Figure 1. Ten cases of 112 (8.9%) had lost two or more lines of CDVA 12 years after ICL implantation due to progressive myopic retinal pigment epithelium alterations without evidence of choroidal neovascularization. The efficacy, safety, predictability and stability over the time of the implanted posterior chamber phakic intraocular lens 12 years after surgery are shown in standardized graphs for reporting refractive surgery data. The spherical equivalent was within 1.00 D of emmetropia for 63.5%, 74.5%, and 34.3% of the eyes 1 month, 1 year, and 12 years after surgery, respectively. Twelve years after surgery, the computed safety and efficacy indices were 1.22 and 0.65, respectively. Refractive excimer laser treatments were done during the first 3 postoperative months following the primary surgery and, therefore, they had no impact on the long-term refractive stability. Preoperative, first year, and last visit mean ECD were 2,586.61 ± 320.14, 2,434.13 ± 290.12, and 2,071.13 ± 361.84 cells/mm2, respectively (Kruskal–Wallis test, P < .05). 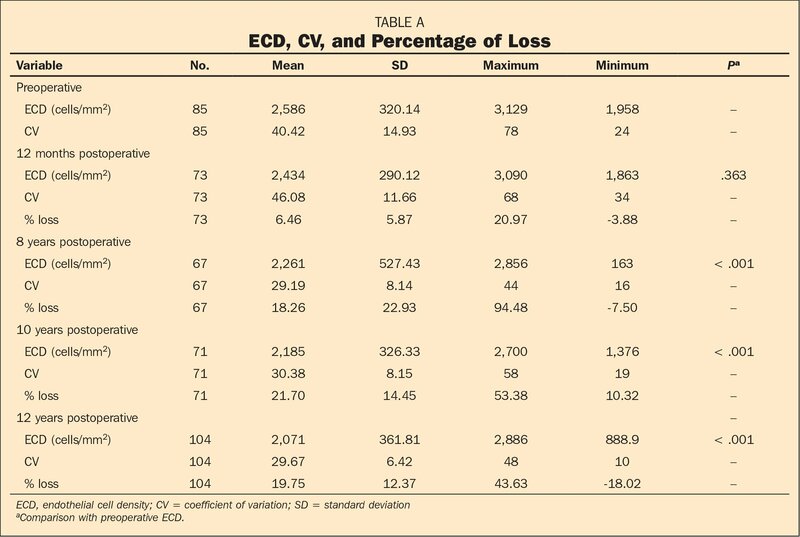 Mean ECD values, coefficient of variation, and relative ECD loss (%) over the years are shown in Table A (available in the online version of this article). 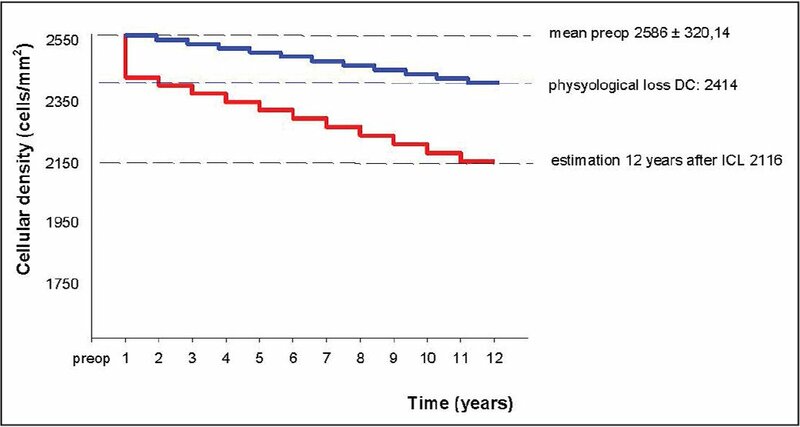 Moreover, Figure 2 depicts a life analysis of the evolution of ECD expressed in percent of loss and compared with the physiological decrease in the ECD. Life analysis graphs showing the evolution of endothelial cell density (ECD) expressed in percent of loss and comparing the theoretical and physiological drop in ECD for a healthy unoperated eye (blue line) and the observed reduction in the eyes included in the series (red line). The first step represents the estimation of endothelial cell loss, which could be attributed to the surgical act (12 months after the implants). The following 11 stages have been calculated by distributing the final ECD drop between the remaining clinical controls. The mean vaulting (ie, distance between the apex of the anterior crystalline and the central part of the back surface of the ICL’s optic) decreased from 444 ± 204 microns at the first day postoperative visit to 272.4 ± 157.2 microns 12 years later (paired Dunn’s test, P < .05). Twenty of 144 eyes (13.88%) developed significant lens opacity, although a bilensectomy (PC-PIOL explantation and phacoemulsification followed by PC-IOL implantation) was required only in 11 of them (7.63 %); it was performed 107.5 ± 44.0 months after PC-PIOL implantation. In these 11 cases, CDVA decreased by 3.9 ± 1.2 lines (relative to the preoperative visit) but it increased again by 3.0 ± 2.4 lines after the bilensectomy (which was uneventful in all cases). The diagnosis of clinically relevant cataract was not statistically related to patient age at the time of the implantation (Mann–Whitney U test, P = .33), anterior chamber depth before PC-PIOL insertion (Mann–Whitney U test, P = .58), preoperative spherical equivalent (t test, P = .17), or 1-day (Mann–Whitney U test, P = .98) or 8-year (Mann–Whitney U test, P = .50) vaulting. Regarding other qualitative variables (gender, type of iridotomy, or PC-PIOL model), only the choice of V3 ICL (vs V4-ICL) was significantly correlated with greater incidence of cataracts (chi-square test, P = .007). Mean IOP was 14.54 ± 3.30 and 13.80 ± 3.62 mm Hg at the preoperative and 12-year visit, respectively (Mann–Whitney U test, P = .082). At the first day postoperative visit, IOP values were significantly higher than those estimated 6, 12, and 48 months and 8 and 12 years after surgery (Kruskal–Wallis test, P < .05), and in 22 of the 140 cases (15.71%) IOP exceeded 21 mm Hg. Drops of a hypotensive agent were administered 1 month postoperatively to 15 eyes (10.41%), 6 months to 6 eyes (4.16%), and 1 and 12 years to 4 eyes (2.77%). One untreated eye (of the 112 eyes that were examined at the 12-year visit) had an IOP that exceeded this number. No surgical intervention was performed to lower the IOP. Eight patients (5.55%) reported dysphotopsia during the course of the study. One of them was treated by suturing a peripheral iridotomy, which was excessively wide. One eye (0.69%) was diagnosed at the first postoperative visit with PC-PIOL subluxation, which was associated with an erroneous sizing of the IOL. In this case, the lens was replaced with a bigger implant with the haptics oriented along a different axis. In one eye, an oversized PC-IOL with excessive vaulting was detected in the first postoperative visit; this lens was successfully replaced a few days later. There were 5 cases (3.47%) of retinal detachment during the 12-year follow-up period. One of the cases followed a severe trauma of the eyeball, and in the rest of the cases it happened spontaneously. All of them were successfully treated by pars plana vitrectomy. Choroidal neovascularization was diagnosed in 3 (2.08%) eyes 4, 8, and 10 years after PC-PIOL implantation. One eye (0.69%) presented a macular hemorrhage without angiographic evidence of subretinal neovessels 6 months after surgery. The spherical equivalent was within 1.00 D emmetropia in 74.5% and 34.3% of eyes, 1 and 12 years after surgery, respectively. Higher predictability rates were obtained 1 year postoperatively (compared to the 1-month visit) due to the fact that all refractive excimer laser (aiming to correct those refractive errors that exceeded the capability of the marketed PIOLs) had been performed within 3 months of the primary surgery. Up to 94.7% and 88.8% of eyes were within 1.00 D of emmetropia, as reported by Stulting et al.27 and Sanders et al.14 in the reports of prospective U.S. Food and Drug Administration trials for Artisan and ICL PIOLs. Obviously, these studies included only patients whose refractive error could be fully compensated by means of the PIOLs that were available in the market. An excessive vaulting of the PC-PIOL can lead to pigmentary dispersion or angle closure.7,28–30 In our study, we came across one case of oversized PC-PIOL that led to its explantation. On the other hand, we have observed a progressive reduction in PC-PIOL vaulting similar to that previously reported in the literature, which could be due to a continuous thickening of the crystalline lens.31,32 However, we did not find a significant correlation between lower vaulting values and the incidence of clinically relevant cataracts, which is in agreement with the findings of other authors.7,29 We are aware that this lack of statistical significance can be due to an insufficient statistical power, taking into account the small number of eyes that developed clinically relevant lens opacity. Of the other seven variables analyzed in our study group, only the choice of ICL model was significantly correlated with the cataract incidence rate. In this sense, higher rates were found among the V3 model wearers, as had already been reported in previous studies.7,33 In fact, changes in the design were made to the V3 model to reduce the incidence rate of that pathology, leading to the launch of the ICL V4 model. Recent improvements in the design of the ICL PC-PIOL include a hole in the central area of the optic with the aim of facilitating the circulation of aqueous humor between the PC-PIOL and the lens.8 Nine of the 20 eyes diagnosed as having clinically relevant cataracts did not undergo bilensectomy because of the patient’s choice or because retinal alterations were considered to cause the majority of the visual defect. A decrease in ECD after PC-PIOL implantation has been considered a minor concern, bearing in mind that the distance between the implant and the corneal endothelium is greater than in the case of anterior segment PIOLs.36 The highest drop was found during the first year of follow-up (it is thought to be induced by the surgical trauma), but no other significant drop was observed, with rates ranging from 3.7% to 12.3% depending on the particular study.10,14,37,38 In the current study, similar ECD loss rates have been found, even though data available in the literature refer to shorter follow-up periods. Supposing a physiological ECD decrease rate of 0.56% per year,24,25 a healthy eye that has not undergone surgery would reach the age of 85 years with more than 1,900 cells/mm2. Based on these values and using a similar amortization equation, we can estimate a 6.46% surgically induced ECD decrease during the first year and an average yearly decrease rate of 1.20% after that. This means that a hypothetical 30-year-old patient with a basal ECD of 2,586 cells/mm2 (mean preoperative value for age-matched patients included in our study) who had ICL implantation would reach 1,500 cells/mm2 (the threshold value below which explantation is recommended) at the age of 70 years (ie, 40 years after implantation). 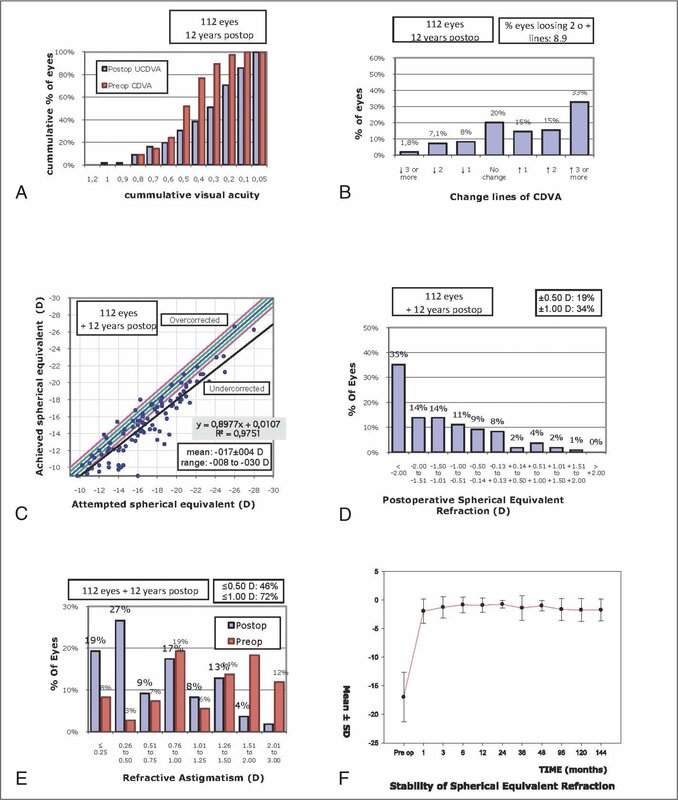 Taking into consideration that at this age the majority of myopic patients have already undergone cataract extraction and that—applying the amortization equation estimated for the current series—a critical level of 800 cells/mm2 would be reached 92 years after the implantation, we can conclude that endothelial cell damage does not appear to be a significant threat for our patients. In any case, longer term series should be analyzed for confirming this apparent indemnity for the endothelial cell population. In the same way, even though steroidal postoperative treatments, pigmentary dispersion, and pupillary blocking have been reported to be potential causes of glaucoma after PC-PIOL implantation,19,28,39 those events had no significant impact on our study, because only four eyes required drug therapy to keep their IOP under control 12 years after ICL implantation. An initial hypertensive response observed in the early postoperative period was followed by a return to preoperative IOP levels. The only non-controlled case was detected during the last visit and a treatment with drops was started at that time. Although due to their particular anatomical features highly myopic eyes have an increased risk of developing vitreoretinal pathology, PIOL implantation has been associated with an even higher incidence rate, irrespective of the model of PIOL implanted.22,24,27,40–43 The values obtained in our study (3.47% of retinal detachment, 2.08% of choroidal membrane, and one case of macular hemorrhage) are not far from the rates of posterior segment pathologies reported in other studies having shorter follow-up periods. In this long-term study, the ICL PC-PIOL offered good refractive outcomes and stability over a long period of time (12 years). Cataract incidence rate depends on the ICL model implanted and is expected to drop significantly with the recent improvements in the design of intraocular lenses. Apple DJ, Werner L. Complications of cataract and refractive surgery: a clinicopathological documentation. Trans Am Ophthalmol Soc. 2001;99:95–107. Zaldivar R, Davidorf JM, Oscherow S, Ricur G, Piezzi V. Combined posterior chamber phakic intraocular lens and laser in situ keratomileusis: bioptics for extreme myopia. J Refract Surg. 1999;15:299–308. Zaldivar R, Davidorf JM, Oscherow S. Posterior chamber phakic intraocular lens for myopia of −8 to −19 diopters. J Refract Surg. 1998;14:294–305. Javaloy J, Alió JL, Iradier MT, Abdelrahman AM, Javaloy T, Borras F. Outcomes of ZB5M angle-supported anterior chamber phakic intraocular lenses at 12 years. J Refract Surg. 2007;23:147–158. Alió JL, Pinero D, Bernabeu G, Galal A, Vargas JM, Ismail MM. The Kelman Duet phakic intraocular lens: 1-year results. J Refract Surg. 2007;23:868–879. Chung TY, Park SC, Lee MO, Ahn K, Chung ES. Changes in iridocorneal angle structure and trabecular pigmentation with STAAR implantable collamer lens during 2 years. J Refract Surg. 2009;25:251–258. Sanders DR. Anterior subcapsular opacities and cataracts 5 years after surgery in the Visian implantable collamer lens FDA trial. J Refract Surg. 2008;24:566–570. Sanders DR, Vukich JAGroup ICLiToMS. Incidence of lens opacities and clinically significant cataracts with the implantable contact lens: comparison of two lens designs. J Refract Surg. 2002;18:673–682. Chang JS, Meau AY. Visian collamer phakic intraocular lens in high myopic Asian eyes. J Refract Surg. 2007;23:17–25.